National Geographic offers some of the most beautiful film material, of nature and culture, one can imagine. When I heard that Dr Bill Schindler would co-star together with Cat Bigney in a series recreating humankind’s ancestral journey, I was thrilled. I met Schindler for the first time in 2006 in Lejre Land of Legends, Denmark. He was on a Stone Age field trip together with some other prominent so-called primitive technologists from the States. Schindler and Bigney’s show is not a prehistoric live action role-play or live interpretation of how the past was like (just look at their shoes). It is a survival show. They demonstrate techniques within a very good narrative and teach great stories about the survival of early humans in tough circumstances while showing different options. In later years, Schindler returned to Europe with his archaeology students from Washington College in Maryland to learn things by hands on practice. Schindler is not only very hands-on – he knows many ancient techniques first-hand – he is also very knowledgeable about archaeology around the world. His driving force is the wish to explain how humankind nourished and lived in the past – and lessons we can learn from the past for ourselves. His students learn what is behind even a simple meal. Have you ever made your own beer? Could you hunt an animal and would you know how all the parts of that animal can be used? Trying all this out makes one appreciate food much more. Bill Schindler is a charismatic and knowledgeable person and having him in a National Geographic TV series on the Great Human Race is spot-on. He co-hosts it with Cat Bigney, a survival and primitive skills instructor at Boulder Outdoor Survival School (BOSS), which is a great combination. 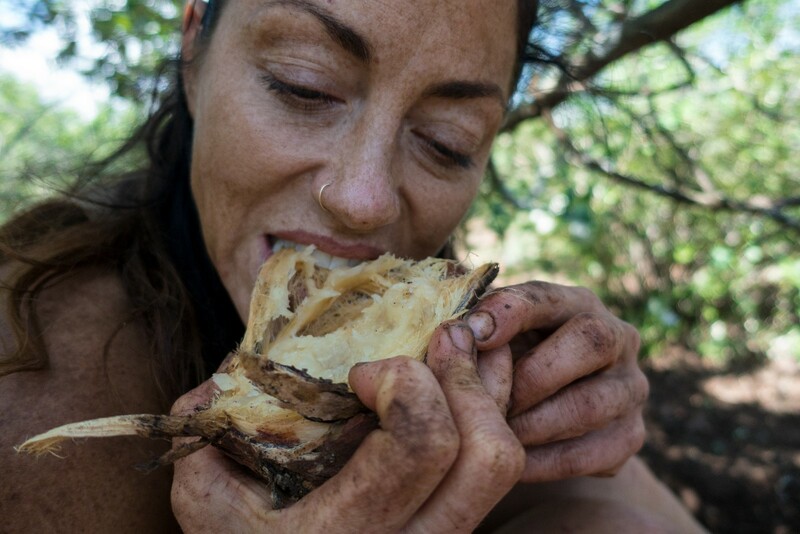 Working at BOSS has allowed her to collaborate with some of the top survival experts in the world. She seems to have great experience. The question is however, can experts like Schindler and Bigney accurately replicate the challenges Stone Age humans faced. The evolution of humankind dates back about seven million years when walking upright began and has still not ended. This evolution was not linear one moving towards what we are now. It is not even a family tree, but a series of lines of development, which cross each other, split, and merge. A high number of different kinds of human lived simultaneously. We, Homo sapiens, are much further evolved than our ancestors were. In comparison to for example Homo habilis: Homo habilis was a very early human being, without weapons or fire. Who knows what was in their mind? We cannot imagine how different life was for them compared to ours – not only regarding techniques used, but also in cooperation and communication. Their environment was the African savannah, their tools mainly rocks and perishable materials, their main challenge: survival. Imagine that it was the survival of the fittest – not of the smartest. It would be unfair to call them primitive in a derogatory way: for them it would be as hard to survive in our world as for us in theirs. The ones who could adapt best as well as the luckiest would survive. Their main quality was in their ability to cooperate with each other, to form social networks. Ninety-nine percent of our past is Stone Age, so just imagine the impact of that on who we are and what we do. It is interesting to think about the question ‘who do we want to have been?’. Research always mirrors present priorities. In the 1960s, we believed we recognised the same aggression in Stone Age as we did in the Cold War world politics. A decade later, palaeoanthropologists were interested in gender and feminism in the Stone Age and nowadays much of the funded research is into climate questions. Can we truly relate to the past, of millions of years ago? Was Stone Age ‘the good life’ we are missing? Should we all adopt the Paleo Diet – or did people in the old days not get as old as we strive to get? Is Stone Age ‘as good as it gets’? Or was nothing human strange to those Homo habilis either? Compared to Homo habilis who lived their whole life in the savannah, Bigney and Schindler are not doing too badly, Schindler saying: “this is kinda crazy (…) a lot more challenging than I thought (…) to be able to use these tools, the same tools as our ancestors did and accomplish something just like this. It’s overwhelming.” If Schindler or Bigney were thrown back in time, their tool making and survival capacities would give them much better chance than an average modern Northern American, or even habilis, but their survival may be much more dependent on their abilities to be accepted as a part of a group of Stone Age people. The key to survival for modern humans however, is their ability to adapt in our fast changing natural and cultural world. For Schindler and Bigney it is not so much ‘turning off’ their Homo sapiens ideas and strategies. Schindler has a big advantage from archaeology – excavating for the past 200 years taught us so much about the thousands of generations before us. Schindler knows the ‘kit’ Homo habilis had, the technical knowledge in their mind. But knowing a technique is different to mastering it. It is hard for a modern human to step back in time and ‘act like that’. Schindler and Bigney did not grow up in the savannah, have not survived numerous attacks and dangers in the wild, but in this series they do an amazingly good job, facing many of the challenges of our Stone Age ancestors. We can replicate their challenges, we can learn the same lessons, we can not only survive but also thrive but in doing so how far do we stick to only Homo habilis tips & tricks? We are different; just look at the Hadza people living in the area of Homo habilis today. Schindler and Bigney’s show is not a prehistoric live action role-play or live interpretation of how the past was like (just look at their shoes). It is a survival show. They demonstrate techniques within a very good narrative and teach great stories about the survival of early humans in tough circumstances while showing different options. 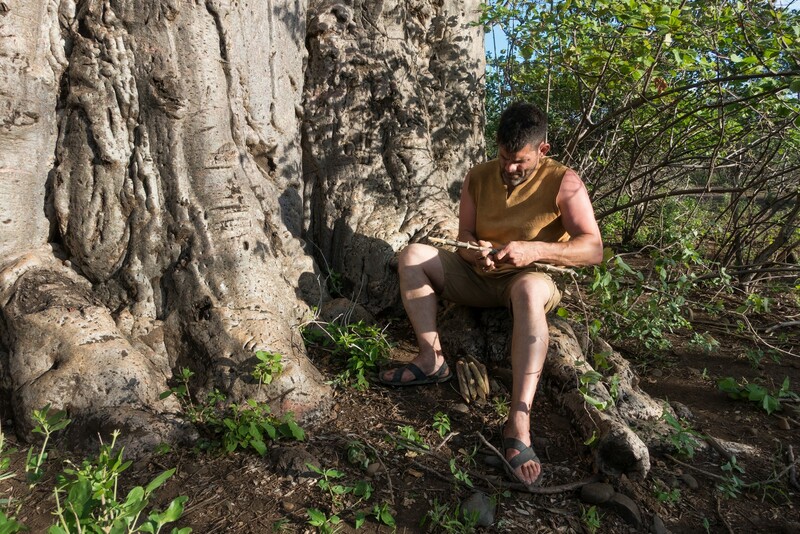 Schindler and Bigney rely on experimentation and experience by thousands of specialists over the past few generations from all continents; experimental archaeologists, primitive technologists, archaeologists and craftspeople alike. The most important thing however is that this is not book-knowledge but personal experience – and how does one respond to sudden ‘changes of the script’? A lion popping up right in front of them was probably not in the screenplay and they were lucky things did not go wrong. It will be wonderful to watch this travel via ten episodes from East Africa, through the Middle East, Mongolia, Alaska and eventually reaching what are now the United States. I hope each part will be as interesting as the first one. Before I knew it it was already over. 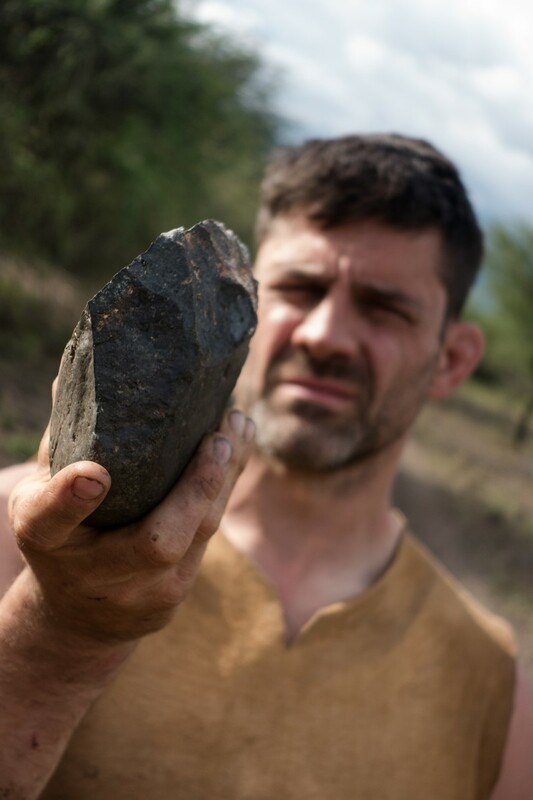 The Great Human Race TV series teaches us a lot about Stone Age. It is both a travel in time and a travel on Earth, from the cradle of civilization to the New World. However, it is not a scientific experiment nor experimental archaeology. The TV series is great infotainment with nicely done graphic approaches in comparing the adventures of Schindler and Bigney with what we know about the past from archaeology and palaeoanthropology. The drawings and explanation are very well done. It would have been even better if there would be an extensive website going with this series explaining more in depth. The site http://channel.nationalgeographic.com/the-great-human-race/gives some information on the series, but does not go deep enough.